Figure A. Alexa Fluor488 conjugated mouse anti human CD3 (MCA463A488) and Alexa Fluor647 conjugated mouse IgG1 isotype control (MCA928A488). Figure B. Alexa Fluor488 conjugated mouse anti human CD3 (MCA463A488) and Alexa Fluor647 conjugated mouse anti human CD69 (MCA2806A647). All experiments performed on PBMCs extracted from human blood stimulated with PHA and LPS for 48 hours gated on lymphocytes in the presence of Human Seroblock (BUF070A). Data acquired on the ZE5™ cell analyzer. Mouse anti Human CD69 antibody, clone FN50 recognizes the human early activation antigen CD69, also known as activation inducer molecule (AIM), Early T-cell activation antigen p60, EA1 or MLR-3. CD69 is a 199 amino acid single pass type II transmembrane glycoprotein of ~30 kDa containing a single C-type lectin domain and a single potential N-glycosylation site. CD69 is expressed as a disulphide bond linked homodimer of ~60 kDa (López-Cabrera et al. 1993). CD69 is a marker of early activation expressed by B and T lymphocytes, natural killer cells(Werfel < em> 1997), neutrophils, thymocytes and platelets (Gaviol et al. 1992). Expression of CD69 is rapidly induced on activation by infection or chronic inflamation (Sancho et al. 2005). Multiple dimeric glycoforms of CD69 can be formed through differential glycosylation of the monomeric subunits (Vance et al. 1997). Mouse anti Human CD69 , clone FN50 is useful for the detection of CD69 by flow cytometry and immunohistochemistry on frozen tissue sections. Holte, H. et al. (1989) Ki67 and 4F2 antigen expression as well as DNA synthesis predict survival at relapse/tumour progression in low-grade B-cell lymphoma. Int J Cancer. 44 (6): 975-80. Herberth, M. et al. (2010) Differential effects on T-cell function following exposure to serum from schizophrenia smokers. Mol Psychiatry. 15 (4): 364-71. Schaeuble, K. et al. (2011) Cross-talk between TCR and CCR7 signaling sets a temporal threshold for enhanced T lymphocyte migration. J Immunol. 187 (11): 5645-52. Sela, M. et al. (2011) Sequential phosphorylation of SLP-76 at tyrosine 173 is required for activation of T and mast cells. EMBO J. 30 (15): 3160-72. Schwitalle, Y. et al. (2004) Immunogenic peptides generated by frameshift mutations in DNA mismatch repair-deficient cancer cells. Sutavani, R.V. et al. (2013) CD55 Costimulation Induces Differentiation of a Discrete T Regulatory Type 1 Cell Population with a Stable Phenotype. Walter, G.J. et al. 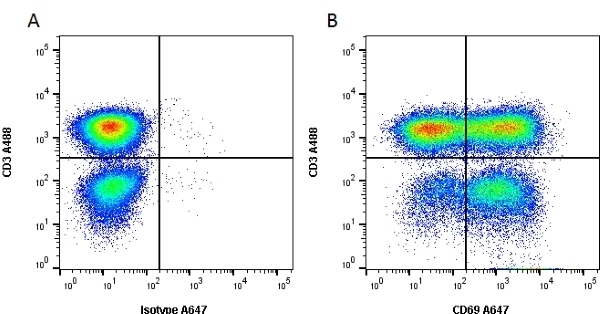 (2013) Interaction with activated monocytes enhances cytokine expression and suppressive activity of human CD4+CD45ro+CD25+CD127(low) regulatory T cells. Kuric, E. et al. (2017) Demonstration of Tissue Resident Memory CD8 T Cells in Insulitic Lesions in Adult Patients with Recent-Onset Type 1 Diabetes. Am J Pathol. 187 (3): 581-8. Karnell, F.G. et al. (2017) Reconstitution of immune cell populations in multiple sclerosis patients after autologous stem cell transplantation.